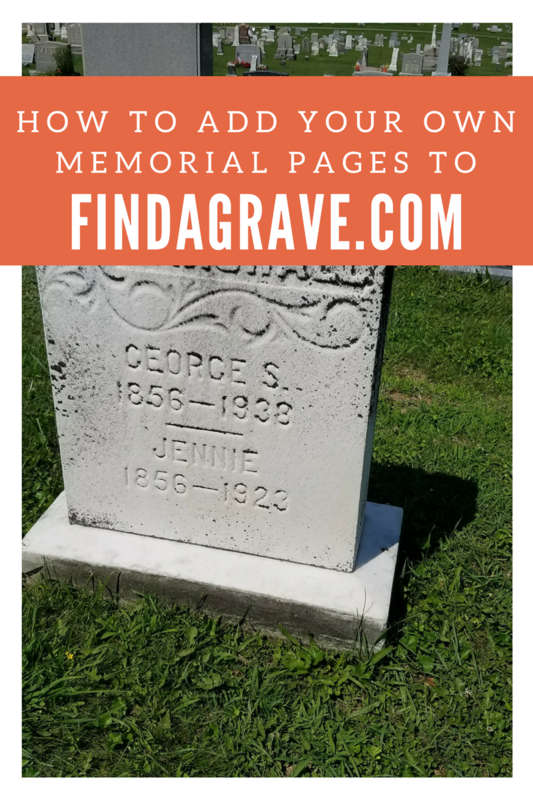 If you’re read much of this blog, you may have noticed that Findagrave.com is one of my favorite genealogy research sites. 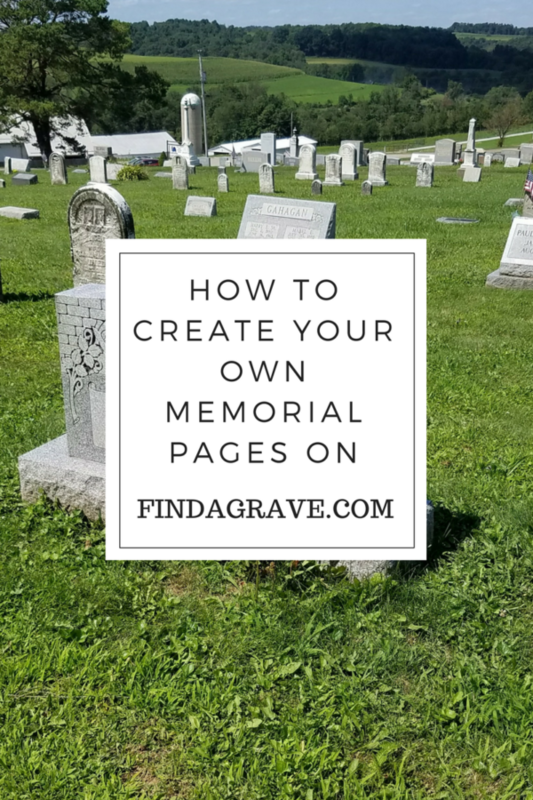 One thing you might not realize right away is that volunteers create all of those helpful Findagrave.com pages, called “memorials.” By volunteers, I mean people who use the site and decide to contribute. I recently began creating my own memorials on Findagrave.com. I didn’t stop with my own ancestors and relatives, though. 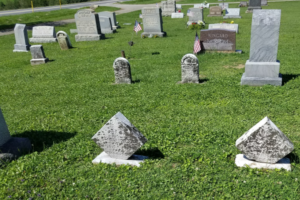 I wanted to “pay it forward” for all the other kind folks out there who have created the Findagrave memorials that I’ve used in my genealogy research over the years. I recently visited two graveyards where many of my relatives and ancestors are buried. I took dozens of photos, including pictures of gravestones for people who aren’t of any known relation. Later, I used my gravestone photos to create new Findagrave memorials. 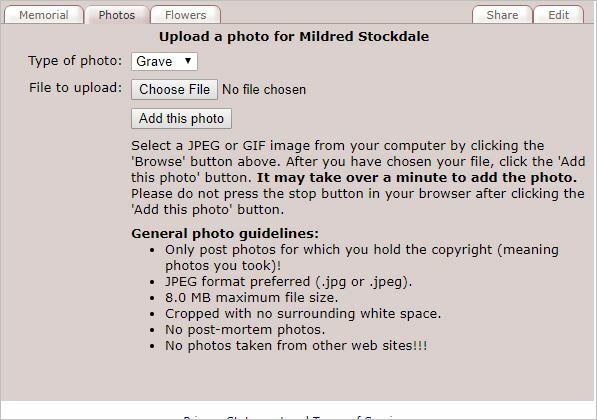 Once you’ve been using Findagrave.com for awhile and have become comfortable with it, you may want to add your own memorial pages to the site. Here’s how to do that. First, you’ll need to create a free Findagrave.com account if you haven’t already. Findagrave.com doesn’t ask for much information other than your name, a username, your email address and a password. You can optionally enter your ZIP code. If you’re looking to create a new Findagrave memorial page for someone, I’m going to assume that you’ve already searched Findagrave.com to make sure that person doesn’t already exist in the database. 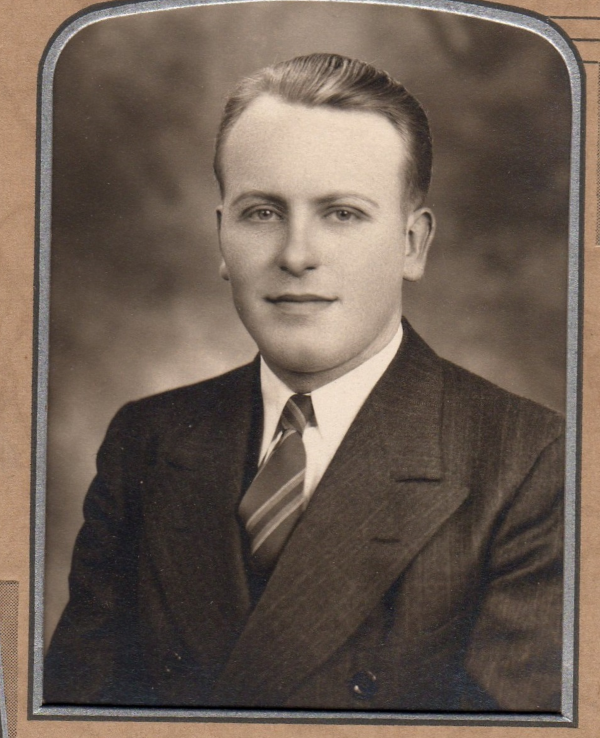 While you’re at it, see if you can find the mother, father, and spouse(s) of the deceased person in Findagrave.com. If a memorial exists for that person, he/she might already be linked to those people as a relative. If not, make note of the memorial numbers for the person’s parents and/or spouse(s) for use later. You can use those numbers to link to the new memorial you create. If you can’t find your chosen relative’s parents or spouse, you may want to add those folks to the list of memorials you’d like to create later. Before you get started, you’ll need to find out where this person is buried. Ideally, you’ll have visited the grave site and taken a photo of the headstone. If not, you can search Ancestry.com for birth, marriage and death records and search their obituary collection to find out where your relative was interred as well as his/her dates of birth and death. Look up the appropriate cemetery at Findagrave.com, then search that particular cemetery’s records to make absolutely certain that your proposed entry doesn’t already exist. Findagrave’s search function is very picky, so you have to enter the exact spelling of a name as it’s listed in their database. One thing you can do is list all interments in the cemetery and eyeball the list. It’s possible that someone created a memorial with a different spelling of the deceased person’s first or last name. You don’t want to accidentally create a duplicate entry. Gather your information before you start creating memorials. Findagrave doesn’t require much information on a deceased person to create a memorial, but I strongly recommend that you only create one for someone if you have the first and last name, year of birth, year of death, and preferably a headstone photo. Crop the headstone photo to remove anything in the background (such as other people’s graves) so that you have a nice, clean gravestone shot. Creating a Findagrave.com memorial with just a name is of little use to anyone and probably not worth the time it takes you to create the memorial page. On the page for the cemetery where your relative is buried, click the link that says Add a name to this cemetery. You’ll see a page where you can enter whatever information you have on the person, including first name, middle name, last name, maiden name, birthdate, and date of death. There’s also a section where you can enter biographical information. You might want to leave this blank for now and come back to it later if desired. Once you’ve created a memorial page for someone, regardless of whether you’re related to him/her, you are the “manager” of that page. You can easily make changes and additions to it whenever you find out more. Once you click “Proceed to step 2,” your memorial is created, and you can click to view your new page. Next, you can click the link to add a photo to your memorial. Click on Add a Photo for This Person toward the bottom right of the page. Make sure you select the type of photo you’re uploading. I recommend uploading the headstone shot first, then follow it with a picture of the actual person later if you have one, so it’ll be the first photo at the top. Click Choose File, double click your chosen picture file, then click Add This Photo. After the upload finishes, you’ll be given the opportunity to create a caption for the photo. This is helpful for pictures with actual people in them, but I don’t find it necessary to caption photos of gravestones since they seem self-explanatory. You can come back and add another photo later if you come across a nice picture of your relative. I prefer photos of the deceased persons when they were young. I know that’s what I would prefer if it were me. I’d rather have a picture of the young me rather than me when I’m elderly unless I magically become much more photogenic in later years. In addition, you can always add photos to memorial pages that you didn’t create. You can also request changes if you find mistakes or would like to add information such as a spouse or parent. For example, if you create a memorial, you might want to make note of the new person’s memorial number and add it as a parent to each of his/her children’s memorials. 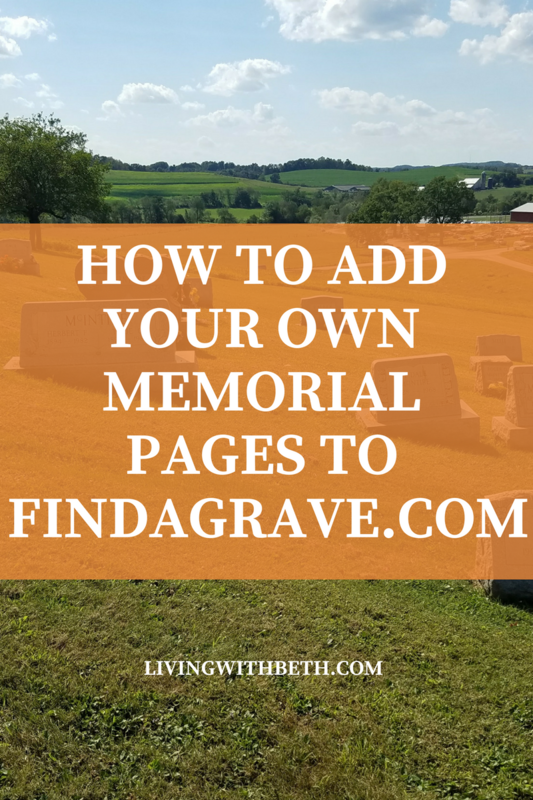 You will need to be logged into your Findagrave account, then click Edit on the memorial page and select the appropriate option for the change you want to request. When you request a change to a memorial managed by someone else, you’ll need to wait for the change to be approved before you see it on Findagrave. However, photos are added immediately without approval. In most cases, if a memorial doesn’t already exist on Findagrave for a particular deceased person, that person’s spouse also does not have a memorial, so it’s a good idea to create one for him/her as well. Your headstone shot might already have both spouses on it, complete with names, birth years and death years. Be careful, though. If one spouse on the headstone doesn’t have a death year yet, that person is probably still alive and wouldn’t appreciate having a Findagrave.com memorial just yet. 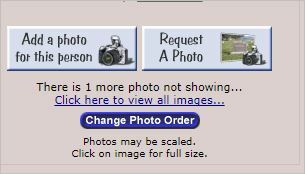 If you don’t have a headstone photo for your new memorial, you can click on Request a Photo. Some Findagrave users volunteer their time to take photos of headstones when other Findagrave users ask for them. Read more of my genealogy posts here! If you enjoyed this post, could you please like it on Facebook and give it a G+1?